08.06.2017 - FEATURE: Right before appearing at the VELUX EHF FINAL4, Anja Althaus announced a turning point in her life by signing a contract with the defending Women's EHF Champions League champions. 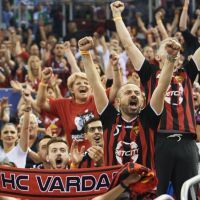 07.05.2017 - FINAL PREVIEW: Vardar broke the curse and reached their first Champions League final but can they pull off yet another offensive masterpiece against the notorious Györ defence? 06.05.2017 - SEMI-FINAL REVIEW: The Macedonian champions frustrated CSM Bucuresti by playing breathtaking attacking handball and reached their first ever Champions League final.